For many, the theorem is not obvious and proof is needed. The earliest known attempt to show the truth of the theorem may have occurred as early as the 18th century BC. Here we provide a demonstration of its truth by showing that all possible rt triangle shapes have sides that satisfy the theorem. This is done by constructing all rt triangle shapes within and touching the Unit Circle, a circle with radius 1. A short side a is placed on the x-axis with one of its ends at the origin. The other short side, b, begins at the end of a that is away from the origin and from there ascends or descends parallel to the y-axis until it intersects the Unit Circle. The long side is drawn from that intersection to join with the side a at the origin. When the length of the side a on the x-axis becomes very much less than 1, the angle between side c and the x-axis, the base angle, becomes large and approaches 90o. As the length of a approaches the value 1, the base angle becomes small and approaches 0o. This range of angle provides for drawing all possible rt triangle shapes and all such triangles have their long side c of length equal to the radius of the circle. Further, the set of points with coordinates x, y that satisfy x2+y2 =1 all lie on a circle with radius 1. The family of all possible rt triangles all have short sides, one of which coincides in length with the x coordinate of a point on the Unit Circle and the other of which coincides in length with that point's y coordinate. For examples, hover your mouse over any of the sixteen base angles listed below. For each base angle chosen, a graph with the corresponding inscribed triangle will be drawn. The graphs show the base angle of the chosen triangle, the x, y coordinates of the triangle's vertex on the Unit Circle and the squares of those coordinates. Closely related to the Unit Circle and the theorem of Pythagoras are the two fundamental trigonometric functions, the sine of an angle, and the cosine of an angle. For any of our family of inscribed triangles, the length of its short side that lies on the x-axis is taken as the value of the cosine of the base angle. Similarly, the length of the short side that is parallel to the y-axis provides the sine of the base angle. In terms of the points around the Unit Circle, their x, y coordinates correspond to the cosine and sine of the angle between the side c and the x-axis, the base angle. That angle is considered herein to increase from the value 0.0o when c is aligned with the positive x-axis through positive values as c is rotated counter clockwise and to decrease through negative values as c is rotated clockwise from alignment with the positive x-axis. 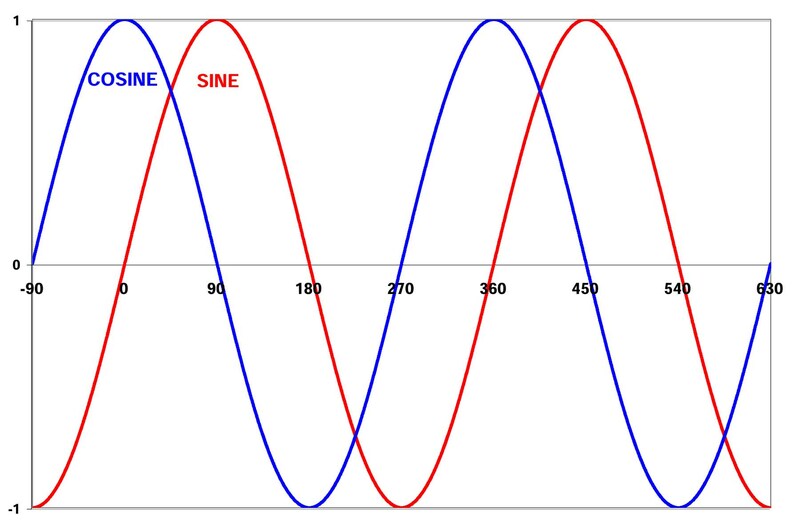 The following graph shows two full cycles of the sine and cosine values versus the angle of rotation. For more compact discussion call the Base Angle, (the angle between c and a), the angle B. Call the angle between c and the other short side A where B = (90-A). From the symmetry seen in the above graph, it should be clear that the sine of B is the cosine of A and vice-versa and thus we can write the identity that sin(A) = cos(90-A). Other clear relationships are that sin(-A) = -sin(A) and that cos(-A) = cos(A). These relationships are valid not only for angles of the given triangles but also for all planar triangles. If the hypotenuse of one of our family of triangles were scaled, up or down, from unity to some value r, its sides would remain in the original proportion but would then have lengths r times cos(A) and r times sin(A). Similarly the length of a short side and one of the angles A or B will allow the hypotenuse to be determined. Returning again to our family of rt triangles, and noting the equality of side lengths to sine and cosine values, we conclude that: sin(A)2 + cos(A)2 = 1. If the triangle were scaled this relationship would not be affected as the r2's would factor out of both sides of the equation. This identity is often used to find cos(X) given sin(X) and vice-versa. The spreadsheet is employed to discover a close approximation to the ratio of a circle's circumference to its diameter.